Lynne snaps and stamps...: How Awesome is That!!! Back in October, I attended a presentation by a famous Canadian children's author that was arranged through work and hosted by a local book store. The author was Sharon Mckay, of Charlie Wilcox fame. 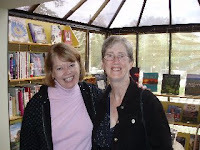 Over the years, working in elementary school libraries, I had read many of Sharon's books and had enjoyed them all. My favorite was 'Esther'. Whe reading Sharon's books, I had always wondered if Sharon was the Sharon McKay I went to school with back in Montreal. I no longer have to wonder, because is Sharon is the same Sharon McKay that I went to school with!!! Before the presentation, I went over and introduced mysef to Sharon (I'm sure some of the staff I was with must have wondered about the screaming that was going on in our corner of the store) as Sharon recognized me right away. After 40 years our paths have crossed again. And what is even more miraclous we are living within about 10 miles of each other in a community about 500 miles from where we grew up. Luckily and thankfully the owner of the bookstore had a camera and quickly snapped the above picture of the two of us.